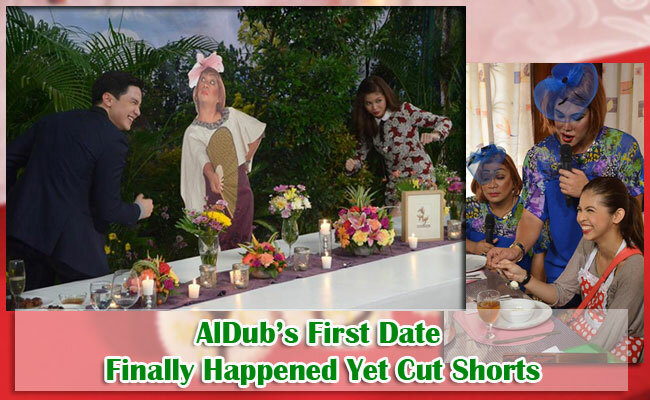 After much anticipation, the viral love team, AlDub, finally had their first date. Their first date happened after more than two months of meeting each other via split screen. Maine Mendoza’s character Yaya Dub and Alden Richards finally formally met in a date despite a lot of hardships and challenges. The date happened a week after the couple had been abducted by Duhrizz, Lola Nidora’s granddaughter. Apparently, Duhrizz liked Alden and she was jealous of how Lola Nidora cared for Yaya Dub. Feeling guilty, the grandmother who usually is against the love team gave a surprise. She gave Yaya Dub four cupcakes with individual letters T, A, D, and E which Yaya had to unscramble. After a few minutes of teasing from the mainstays of the show, Yaya Dub was finally able to spell out the word DATE which gave fans something to look forward to for the weekend. Lola Nidora decided to let the two meet up on a date she herself had planned. However, there are certain conditions that Lola Nidora had strictly laid out. The two must not touch each other at all cost and Yaya Dub must be back at home before the Eat Bulaga ends. By Thursday, the hype of the fans had steadily increased. The two even had a compatibility test, and much to the fans’ delight, they got 5 out of the 7 questions. Then on Friday, Lola Nidora’s sisters, Tidora and Tinidora taught Yaya Dub some table manners, helped her picked out her dress and decide of her makeup. Alden was even caught laughing at the girl’s antics. Minutes before the date, Alden even went to Yaya Dub’s parents and asked for their blessings. Fans commented on Twitter and Facebook that this is a culture that many must be reminded of. Upon arriving in the location, the two dined in Yaya Dub’s favorite food, isaw. They also had quail eggs and wine. There were times when the two seemed to be too overwhelmed and wanted to touch each other, yet Lola Nidora reminded them of their agreement with her. Many fans also shared that the table is too long for a date. Soon the too almost touched each other, but the alarm for Lola Nidora’s medicine had set off. Yaya Dub ran as soon as she could despite Lola Nidora’s assurance that she was fine. A few moments after, screeching tires were heard and nobody could tell if Yaya Dub had an accident. Despite the date being cut short, Aldub’s fans was able to set a new record on Twitter, making the hashtag #ALDUBMostAwaitedDate trended with more than 12 million tweets in just one day.